This is a photo taken with natural light of a super smiley baby in a red shirt holding her little toes. 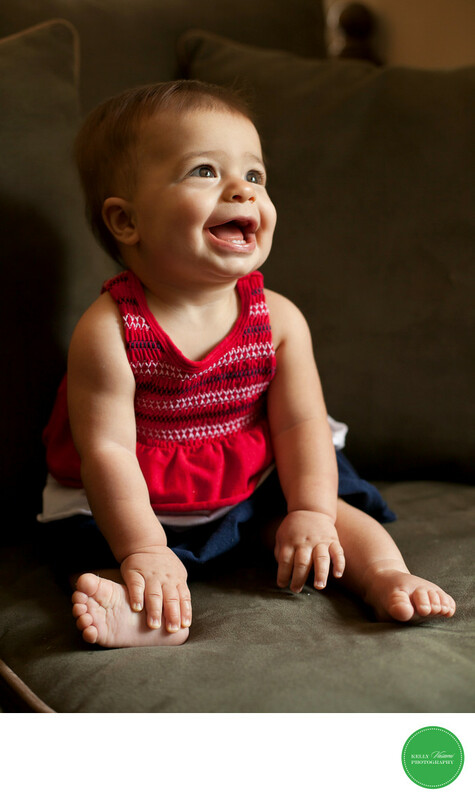 Her eyes are lit up, her smile is wide and she joyfully looks up at her mommy standing nearby. She is sitting up on her own. This is the perfect age to have your baby photographed because they are not able to crawl away just yet. The window provides a lovely directional light that illuminates this sweet baby's features while also providing soft shadows that create a real, unstaged feel to this image. Shooting on her family's sofa adds to the down to earth feel of the photo. When baby gets older, mommy will be delighted to relive the unique toddler smile beaming from her daughter in this image.